Conor Dodd pictured sailing off the Kinsale coast. This summer the Seafest event will show us all how the sea is for everyone. Like the hugely successful event last year, it will show off the possibilities of the activities on the sea, what we can learn from the sea, and how we should respect the sea. And this summer in Galway, two brothers will show how they are taking on a challenge to show us just how accessible a marine challenge can be. In a world first, Conor Dodd, diagnosed as severely autistic and non-verbal takes on Ireland’s leading skippers at the ICRA and West Coast Ocean Racing Regatta in Galway Bay this August 15-18. Together with Eoin, his twin brother who also has autism, the preparations are well underway for their sea going challenge. Based in the NUIG Research And Innovation Centre, the boys work with their parents, Enda and Valerie Dodd, in a start-up company Animated Language Learning. Conor and Eoin together form part of a multi-national team dedicated to developing solutions to autism language deficits the world around. Drawing from their personal experiences of autism, they are software programmers dedicated to the development of language teaching tools using Disney media. Together with their parents, they have created a virtual language school currently supporting over 500 families around the world. The sailing adventure started when Valerie spotted an advertisement for a sail boat in Afloat, a magazine for all things nautical. We started to investigate the boat and discovered it had been stored in a hay shed for 10 years, as the owners had moved on to different pursuits. Enda took a chance and travelled south to see the boat with the boys. Conor has sailed competitively before, having placed second nationally in the Presidents cup, sailing a Sonar, an Olympic class sail boat,” said Enda. “But this is a much bigger enterprise, in that we need to raise the funds to refit the boat while preparing the boys for what will be a grueling ocean race. But this is Galway and here community is understood. “I’m confident we can make this happen,” says Valerie. “The boys’ life has been a series of miracles from their earliest days diagnosed as severely autistic and without hope of ever communicating. Their path to language through Disney movies and love of sport has been an inspiration to everyone who knows them. “For Enda and me it is so important now that the boys grow into rounded adults and truly transcend their autism challenges. It’s not enough to be able to communicate and attend school, but more importantly to be able to interact equally with their typical peers and fully contribute their talents in society,” she added. “This doesn’t surprise me,” commented Fiona Neary, manager of the NUIG innovation center. “There is a determination and bond between the Dodd twins that is really something to see. Conor has a focus that is apparent in everything he does and is relentless in a way that is essential to any successful startup. Rob Gill, fresh from the 2018 Kinsale frostbite series, skippered Conor’s boat during the President’s cup and his national second place finish. 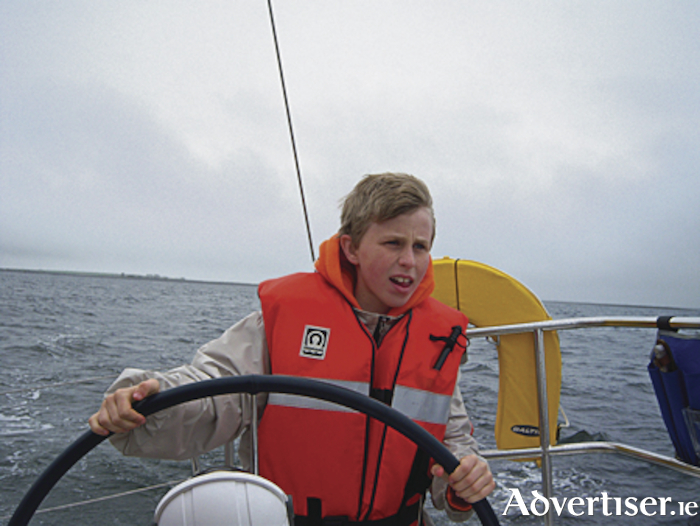 “Conor has a unique ability to learn on the water and never gets fazed on the helm. Racing with him was the first time I ever sailed with a non-verbal person and yet we communicated easily, like we knew each other’s thoughts. “Eoin was a tremendous help, given his verbal skills and social awareness. It was a real honor sailing with them and I will be cheering them on in Galway Bay. I also know how determined Enda and Valerie are and am in no doubt they will raise the funds and resources to make their campaign one to watch,” he said.